Ricky Stenhouse Jr. has become a plate racing master. 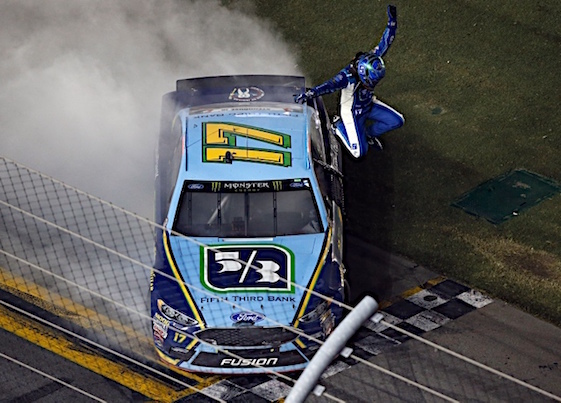 Stenhouse got his first Monster Energy NASCAR Cup Series victory two months ago at Talladega and then on Saturday night, follows that up with a victory at Daytona. “This validates what we did at Talladega,” Stenhouse said in Victory Lane. The Roush Fenway Racing driver got the victory when he passed leader David Ragan after a restart with two laps to go. Clint Bowyer of Stewart Haas Racing finished second. Ragan fell back to a sixth-place finish. A succession of multicar wrecks crippled or eliminated more than a handful of contenders, the most notable of which was Dale Earnhardt Jr., the pole-sitter who was possibly competiting at historic Daytona International Speedway for the final time. (6) Ricky Stenhouse Jr., Ford, 163. (11) Clint Bowyer, Ford, 163. (24) Paul Menard, Chevrolet, 163. (23) Michael McDowell, Chevrolet, 163. (22) Ryan Newman, Chevrolet, 163. (30) David Ragan, Ford, 163. (32) * Brendan Gaughan(i), Chevrolet, 163. (27) AJ Allmendinger, Chevrolet, 163. (17) Erik Jones #, Toyota, 163. (29) Chris Buescher, Chevrolet, 163. (36) Corey LaJoie #, Toyota, 163. (12) Jimmie Johnson, Chevrolet, 163. (28) Matt DiBenedetto, Ford, 163. (8) Jamie McMurray, Chevrolet, 163. (31) Darrell Wallace Jr.(i), Ford, 163. (34) Ty Dillon #, Chevrolet, 163. (20) Daniel Suarez #, Toyota, 163. (4) Kasey Kahne, Chevrolet, 163. (26) Landon Cassill, Ford, 163. (16) Kyle Busch, Toyota, 163. (33) * Elliott Sadler(i), Chevrolet, 163. (2) Chase Elliott, Chevrolet, 162. (14) Trevor Bayne, Ford, 160. (18) Denny Hamlin, Toyota, Accident, 157. (10) Danica Patrick, Ford, Accident, 154. (9) Ryan Blaney, Ford, Accident, 154. (13) Matt Kenseth, Toyota, Accident, 154. (15) Kurt Busch, Ford, Accident, 153. (21) Kyle Larson, Chevrolet, Accident, 153. (37) * Reed Sorenson, Toyota, 147. (3) Brad Keselowski, Ford, Accident, 113. (1) Dale Earnhardt Jr., Chevrolet, Accident, 106. (5) Kevin Harvick, Ford, Accident, 105. (25) Martin Truex Jr., Toyota, Accident, 73. (7) Joey Logano, Ford, Accident, 71. (19) Austin Dillon, Chevrolet, Accident, 70. (39) Jeffrey Earnhardt, Chevrolet, Engine, 57. (40) DJ Kennington, Toyota, Engine, 14. (35) Cole Whitt, Chevrolet, Engine, 9. (38) * Ryan Sieg(i), Toyota, Engine, 7.